Rank lists and Cut off Marks for 5 Years LLB Courses Admission 2017-2018 is Published in the Tamilnadu Law University website http://tndalu.ac.in. TN Law Colleges Admission Notification for Five Years B.A.L.L.B and Three Years L.L.B courses is published on 29th May 2017. How to get application forms? Law College Admission Applications can be obtained directly or in person. Candidates can obtain the application directly from Dr.Ambedkar Law University, Chennai - 28 or from the prinicipals of affiliated colleges and for Government law colleges of villupuram, Dharmapuri and Ramanathapuram and Respective Collector Offices. If you want to get the application via post, you may get it from "The Registrar, The Tamil Nadu Dr.Ambedkar Law University, "Poompozhil", No.5, Dr.D.G.S.Dinakaran Salai, Chennai- 600028. by paying prescribed fee. 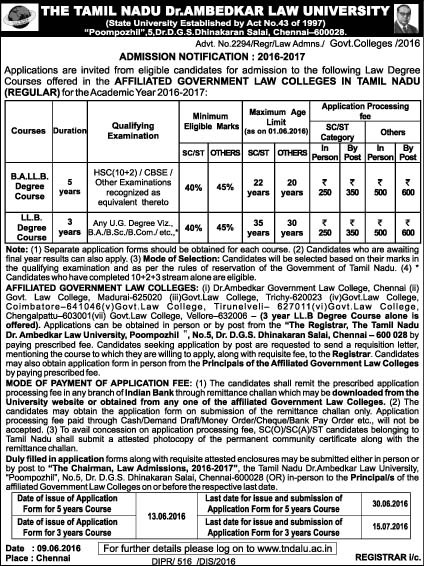 12-07-2016 : Tamilnadu Law Colleges Admission 2016-2017 Counselling dates announced. 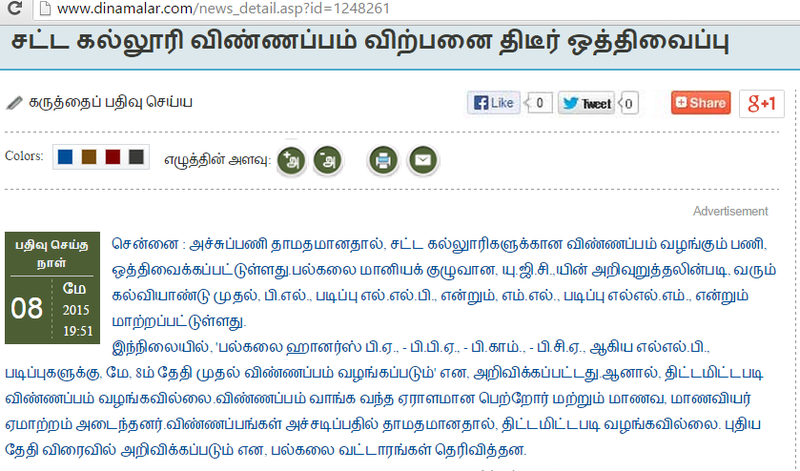 There are 7 Government Law Colleges in Tamilnadu, functioning under Dr.Ambedkar Law University, Chennai. The counselling for the LLB 5 years courses admission 2016 has been announced by the University for total 1050 vacancies. Tamilnadu law colleges admissions 2016-2017 counselling is scheduled to be conducted from 21st July to 24th July 2016. 14-06-2016 : Counselling for the Five Years LLB Honours Course admission will be conducted on 22nd and 23rd of June 2016. 09-06-2016 : Tamilnadu Law Admission 2016 - 2017 Official Notification Published by Dr.Ambedkar Law University Chennai. Admission Notification has been published for BALLB 5 Years and LLB 3Years Courses. 07-05-2016 : Dr Ambedkar Law Universty Chennai - Tamilnadu Law Colleges Admission 2016 - 2017 Notification Published Today. 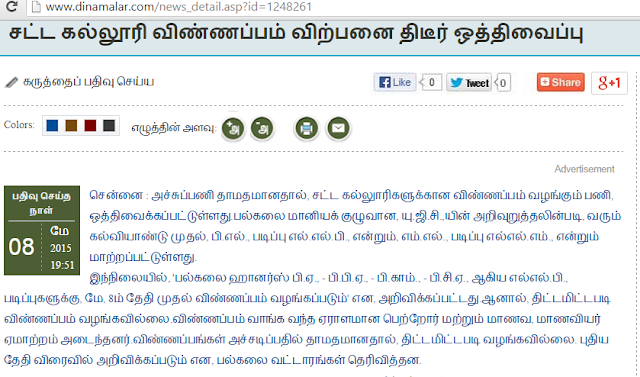 09-09-2015 : Tamilnadu Law Colleges Admission 2015 Three Years LLB Courses Counselling dates and Cut Off Marks Published. 12-08-2018 : Tamilnadu Three Years LLB (foremerly 3Years BL) Courses Admission Application Forms can be procured from today (12-08-2015). The law college admission applications will be issued upto 21-08-2015 . According to todays Tamil Hindu news article, it seems that the candidates who have applied already need not apply once again. Dr Ambedkar Law University of Tamilnadu has published admission notice for the 2015 - 2016 year Law Courses Admission. For more details see the original advertisement published in the Dinathanthi Newspaper on 4/6/15. 11-09-2014 : 3 Years BL Course Rank List to be released soon . 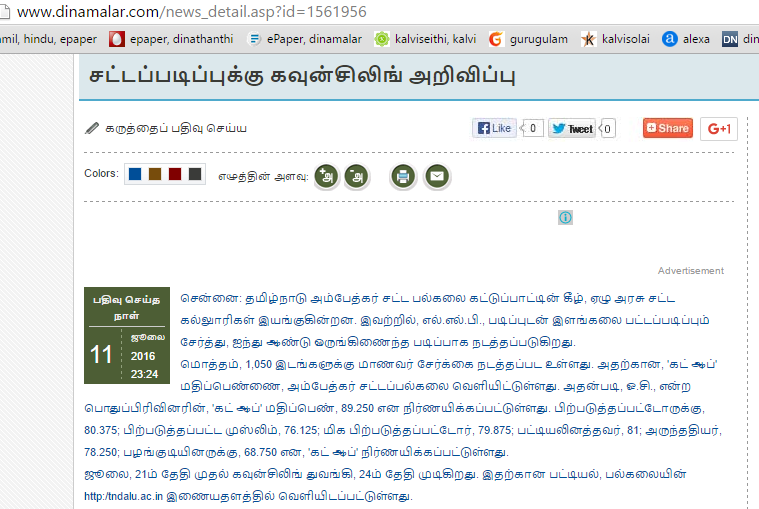 There are 1262 seats in the 7 government law colleges in Tamilnadu at Chennai, Chengalpat, Vellore, Madurai, Trichy, Coimbatore and Tirunelveli. Tamilnadu Dr.Ambedkar Law University will announce the Rank List with in this week and following that cut off details will be published and counselling will be conducted. 08-07-2014 : 5 Year BABL Course Counselling for the 2014 Year Admission Started. This year about 6293 applications accepted for 1,052 seats. The BABL cutoff also increased to above 90 marks. 14.06.2014 : Tamilnadu Law Admission 2014 Counselling is scheduled to be held on 19-06-2014. Tamilnadu Law University Dr.Ambedkar Law University announces admission for 7 government law colleges of Tamilnadu for the academic year 2014-2015. The following details are based on the admission notification for academic 2014-2015 only. For latest admission notification visit Law University Website. The Plus Two completed candidates can apply for 5 years course from comming 12th May 2014. Last date to appy and submit the filled application forms will be 06-06-2014. The final selection list for the Five Year Course will be published on 13-06-2014. Counselling will be held with in 10 days after the final selection list publication. There are total 1052 sheets for five year course this year. Degree holders can apply for the 3 years course from 26th May 2014. The last date to submit the filled application forms will be 11-06-2014. 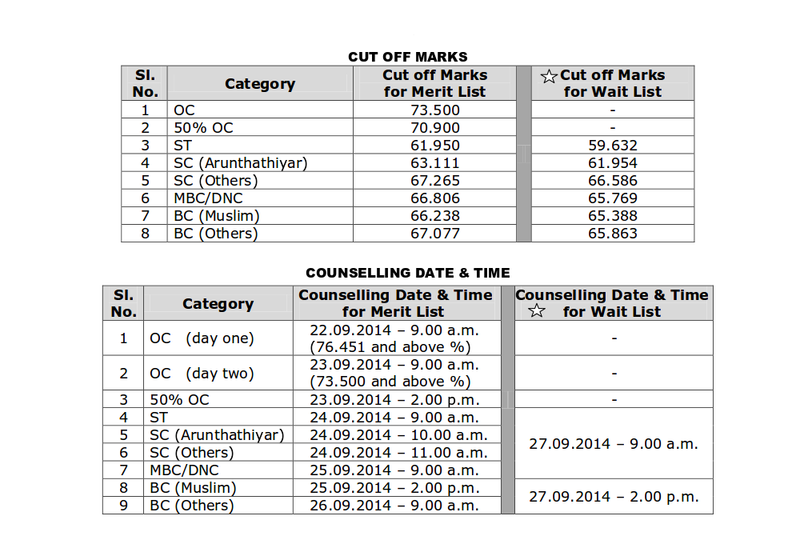 Final selection list for 3 year course will be published on 21-06-2014. There are 1,262 total sheets for 3 year course this year.